There are a lot of important factors to consider when deciding to replace a home’s windows and doors. Not only is it a major project, but the cost can vary depending on how many windows and doors need to be replaced, materials involved, design considerations, and what shape the rest of the house is in. 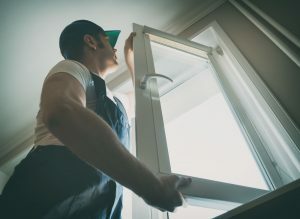 Window replacement is often necessary for economic reasons, especially if drafty windows are costing you money in the summer and winter months. Door replacement can improve a home’s aesthetic appeal, increase security, and also contribute to economic efficiency. Your home’s design and location play a major role in deciding what type of windows and doors you need. Do you live in an area that is prone to severe weather? Sturdier windows and doors made out of heavier materials will last longer and hold up better, decreasing the frequency of replacement. It’s also important, especially with window replacement, to consider replacing all the windows at once. This will save you time and money in the long run. Door replacement is heavily dependent on whether you are replacing outside or inside doors as well. Are you simply trying to replace aged or damaged doors, or is your goal to give your entire home an updated look? If you are considering selling your home in the future, replacing windows and doors, while costly, can increase the value of a home. Even if you aren’t planning to move anytime soon, improving energy-efficiency and keeping your home up-to-date will make it more comfortable and appealing for years to come. Whether you’re considering window replacement, door replacement, or a combination of both, it is best to leave it in the hands of qualified professionals. Hiring a professional not only ensures that the work will be of high and lasting quality, but that it will be done in the most efficient way possible. Contact us online or call 717-639-1303 to get a quote.